Even when we had problematic material related to the management of the war ... we restrained ourselves. In a certain sense, we betrayed our role as journalists, but we did so because we took national, patriotic considerations into account and decided that in the event of war, and certainly a war which was not progressing as it should and was going awry, we were part of the Country; that it was permissible, and even required of us, to postpone disputes and criticism; and that we did not have to apologize, or to feel abashed, for our support and backing of the Army and the Government. ^ "Lebanese Army mostly stays out of fighting". Retrieved 25 November 2011. ^ "(Resistance martyrs in al-Ghandouriya) شهداء المقاومة في الغندورية". as-Safir. 5 September 2007. Retrieved 26 October 2012. ^ a b c d Richard Steiner (10 September 2006). "After the bombs, environmental calamity". Seattle Post-Intelligencer. ^ Press Association (28 July 2006). "Ads urge call for Lebanon ceasefire". The Guardian. London. Retrieved 16 August 2006. The 2006 Hezbollah cross-border raid was a cross-border attack carried out by Lebanon-based Hezbollah militants on an Israeli military patrol on 12 July 2006 on Israeli territory. Using rockets fired on several Israeli towns as a diversion, Hezbollah militants crossed from Lebanon into Israel and ambushed two Israeli Army vehicles, killing three soldiers and capturing two other soldiers. Another five soldiers were killed inside Lebanese territory in a failed rescue attempt. Hezbollah demanded the release of Lebanese prisoners held by Israel in exchange for the release of the captured soldiers. Israel refused and launched a large-scale ground and air campaign across Lebanon in response to the Hezbollah raid. This marked the start of the 2006 Lebanon War. Two years later, on 16 July 2008, the bodies of the two captured soldiers were returned to Israel by Hezbollah in exchange for Samir Kuntar and four Hezbollah prisoners. Hezbollah originally named the cross-border operation "Freedom for Samir Al-Quntar and his brothers", but eventually shortened it to "Operation Truthful Promise" (Arabic: عملية الوعد الصادق‎). The 2006 Lebanon War photographs controversies (also referred to as 'Hizbollywood' or 'Hezbollywood') refers to instances of photojournalism from the 2006 Lebanon War that misrepresented scenes of death and destruction in Lebanon caused by Israeli air attacks. As a result of the scandal, Reuters fired freelance photographer Adnan Hajj, and the AP disciplined several others. Reuters also fired a photo editor, and implemented stricter controls on its photo-gathering process. The controversy began as an investigation of documents by individual bloggers, and spread to print and television media sources.CAMERA, a pro-Israel media watch organization, said that the alleged photographic manipulations were used by the mainstream media in an attempt to sway public opinion and paint Israel as an aggressor, and suggesting that Israel was guilty of targeting civilians. The Adnan Hajj photographs controversy (also called Reutersgate) involves digitally manipulated photographs taken by Adnan Hajj, a Lebanese freelance photographer based in the Middle East, who had worked for Reuters over a period of more than ten years. Hajj's photographs were presented as part of Reuters' news coverage of the 2006 Lebanon War, but Reuters has admitted that at least two were significantly altered before being published. According to various media reports, between 1,000 and 1,200 Lebanese citizens were reported dead; there were between 1,500 and 2,500 people wounded and over 1,000,000 were temporarily displaced. Over 150 Israelis were killed; around 700 wounded; and 300,000–500,000 were displaced.Hezbollah was accused by Israel of deliberately targeting cities and civilian centers in Israel with deadly fire, with its rocket batteries concentrating attacks on Israeli cities along the border, most of which had no direct affiliation with any military activity. In return, Hezbollah claimed its rockets may have hit Israeli civilians areas largely due to weapon inaccuracy, while mostly aiming to hit military and strategic industrial zones. Israel said that it tried to avoid civilians, and had distributed leaflets calling on civilian residents to evacuate, but that Hezbollah stored weapons in and fired from civilian areas and transferred weapons using ambulances, making those areas legitimate targets, and used civilians as human shields. Bangladesh–Lebanon relations refers to the bilateral relations between Bangladesh and Lebanon. There have been many casualties in the 2006 Lebanon War, leading to condemnation of both sides, however the exact distribution of casualties has been disputed. The Lebanese Higher Relief Council (HRC), UNICEF, and various press agencies and news organizations have stated that most of those killed were Lebanese civilians, however the Lebanese government does not differentiate between civilians and combatants in death toll figures. The Israeli government identified 43 Israeli civilians killed by Hezbollah rocket attacks, including four who died of heart attacks during rocket attacks. The Israel Defense Forces (IDF) death toll ranges from 118 to 121, depending on the source and whether or not casualties that occurred after the ceasefire are included. The figures for the Hezbollah fighters killed are the most varying, with Hezbollah claiming 250 of its fighters killed, while Israel claimed to have identified 530 dead Hezbollah fighters. The IDF estimates 600–700 dead Hezbollah fighters. Sources can be conflicting. Ehud "Udi" Goldwasser (Hebrew: אהוד גולדווסר‎; 18 July 1975 – 12 July 2006) was an Israeli soldier who was abducted in Israel by Hezbollah along with Eldad Regev on 12 July 2006, sparking the 2006 Lebanon War. His rank was First Sergeant.On 16 July 2008, the bodies of Goldwasser and Regev were returned to Israel in the 2008 Israel–Hezbollah prisoner exchange. Israeli officials claimed an examination of the bodies determined that the two reservists were killed during the ambush. A Lebanese minister claimed the soldiers were killed during the Israeli bombing. Eldad Regev (Hebrew: אלדד רגב‎, 16 August 1980 – 12 July 2006) was an Israeli soldier, born in Qiryat Motzkin, abducted by Hezbollah fighters along with Ehud Goldwasser on 12 July 2006 in Israel near the Lebanese border, sparking the 2006 Lebanon War. His rank was Sergeant First Class.On 15 July 2008, coffins containing the remains of Goldwasser and Regev were returned to Israel as part of a prisoner exchange. Israeli officials claimed an examination of the bodies determined that the two reservists were killed during the ambush. A Lebanese minister claimed the soldiers were killed during the Israeli bombing. Foreign involvement in the 2006 Lebanon War refers to the supply of military aid to combatants during the course of the 2006 Lebanon War, which has been an important aspect of both the hostilities and the diplomatic wrangling surrounding them, including figuring prominently into UN Security Council resolutions on the topic. Haret Hreik (Arabic: حارة حريك‎) is a mixed Shia and Maronite Christian municipality, in the Dahieh suburbs, south of Beirut, Lebanon. It is part of Baabda District. Once an agricultural village, Haret Hreik lost its rural identity due to the wave of refugees from Southern Lebanon who settled in the town and made it another urban neighborhood of Dahieh. 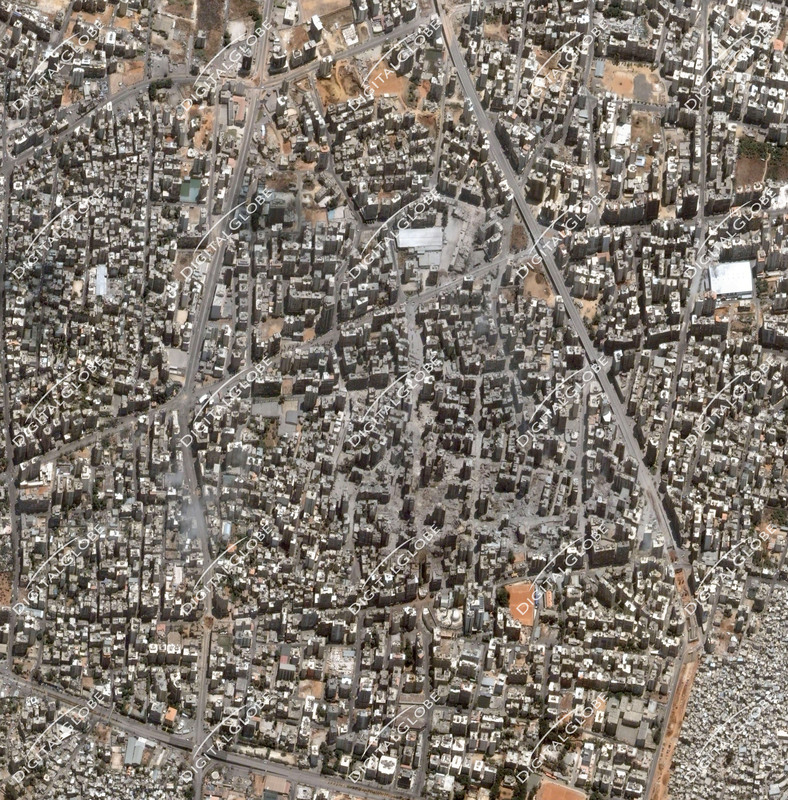 Haret Hreik is located northeast of the Beirut–Rafic Hariri International Airport and north of the towns of Laylake and Bourj el-Barajneh, west of Hadath and south of Chyah. The town is the headquarters of the Shi'ite group Hezbollah. Israeli warplanes destroyed the headquarters and civilian homes on July 2006. Humanitarian aid during the 2006 Lebanon War refers to international efforts for civilian assistance during the 2006 Lebanon War. During the 2006 Lebanon War, a number of international incidents occurred in Lebanon, largely involving United Nations personnel in Lebanon, who have come under a number of attacks. On 25 July 2006, four unarmed United Nations Truce Supervision Organization (UNTSO) peacekeepers were killed during an Israeli air strike on a UN observation post in southern Lebanon. Israel motivated the attack as wrong identification of target as a militant enemy post. This is a list of rocket and mortar attacks on Israel carried out by Palestinian militant groups and/or Muslim Shia or Sunni militant groups from Lebanon. Military operations of the 2006 Lebanon War refer to armed engagements initiated by Israel and Lebanese Hezbollah during the 2006 conflict. Rima Maktabi (born 4 July 1977) (Arabic: ريما مكتبي‎) is a Lebanese TV presenter and award-winning journalist who returned to al-Arabiya after hosting CNN's monthly program Inside the Middle East for two years and previously working at the Arab satellite channel since 2005. She was among several female Arab journalists who first became known through her reporting during the 2006 Lebanon War and who had successful careers afterward, including Maktabi and her former colleague at al-Arabiya Najwa Qassem. Southern Lebanon (Lebanese Arabic: Jnoub, meaning "south") is the area of Lebanon comprising the South Governorate and the Nabatiye Governorate. The two entities were divided from the same province in the early 1990s. The Rashaya and Western Beqaa Districts, the southernmost districts of the Beqaa Governorate, in Southern Lebanon are sometimes included. United Nations Security Council Resolution 1680, adopted on May 17, 2006, after recalling previous resolutions on Lebanon, including 425 (1978), 426 (1978), 520 (1982), 1559 (2004) and 1655 (2005), the Council strongly encouraged Syria to respond positively to Lebanon's request to delineate borders and establish diplomatic relations, with the purpose of asserting Lebanon's sovereignty, territorial integrity and political independence.The resolution, co-sponsored by France, the United Kingdom and the United States, was adopted by a vote of 13 in favour, none against, and two abstentions from China and Russia; both countries believed the resolution constituted interference in the diplomatic relations between Lebanon and Syria.